Luke and Grandpa watching the game: Luke and I spent most of the game running around the stadium, because despite the cookies, books, sippy cups and toys I brought, all he wanted to do was run! 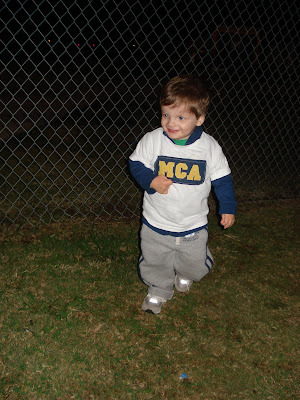 It was FREEZING cold on the night of the game, so Luke wore the MCA shirt I had made the night before OVER his t-shirt and sweatshirt. He looked like the marshmallow man! Hanging out with some of my students. Occasionally he'll play "shy", but on this particular night he didn't know a single stranger :) He sat on several people's laps, gave everyone he passed a high five and could have cared less where I was. ha! 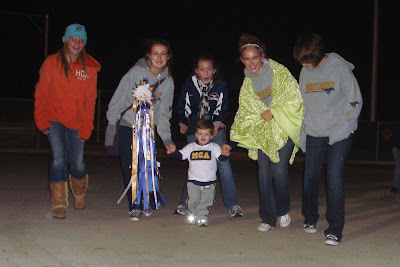 Here's Mr. Man walking around with a bunch of my freshman girls :) He looks like he's having a horrible time, right?!?!?! hahaha Now that I've caught up from Homecoming I'll work on posting pics from last night's game - hopefully not a month late!